The legislative session officially ended on May 4 when lawmakers adjourned. 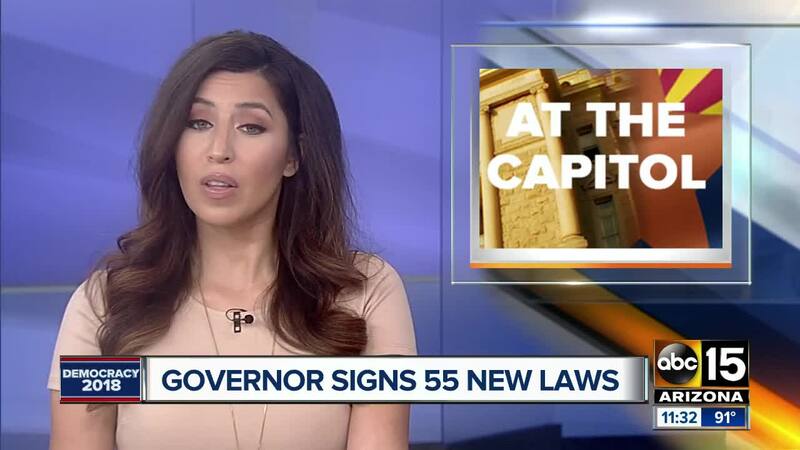 But the governor had until Wednesday to decide whether to sign or veto dozens of bills that were passed in the final days when lawmakers voted on a flurry of bills as well as a $10.4 billion spending plan for the state's next fiscal year. Overall this year, Ducey signed 346 bills and vetoed 23 others. Ducey signed a bill that increases penalties for car crashes that cause serious physical injury or fatalities. Courts will be able to suspend driving privileges for 180 days instead of up to 90 days for violations that result in physical injury, and up to a year instead of 180 days for violations that result in death. It also increases a cap on restitution from $10,000 to $100,000, among other changes to how penalties are classified. Some Democrats voted against the measure. More than a year ago, Pamela Hesselbacher was killed when she and her two children were struck by a car while crossing the street in a crosswalk near Ray Road and College Avenue. Hesselbacher's kids suffered critical injuries but survived. William Epperlein was behind the wheel despite having a suspended license and multiple prior DUIs. Because his license was suspended and not revoked, the County Attorney's office decided to not pursue felony charges against Epperlein due to lack of evidence. In response, Hasselbacher's family had pushed to change an Arizona law that recommends misdemeanor charges if a driver has a license that is suspended rather than evoked.